Did You Know you could be saving money by buying your products with us!? 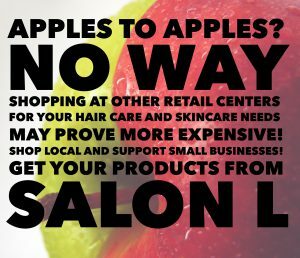 – Salon L.
Did You Know you could be saving money by buying your products with us!? You might think you are saving money buying at other retailers, but are you REALLY??? We looked up a couple of our popular products for comparison. Oribe dry texturizing spray 8.5oz with us is $42.00 compared to same website as mentioned above their price is $46. Also we will accept competitors coupons! Want to get $10 off your next appointment!? ?